Hong Kong’s Ng Ka Long won his home Superseries title on Sunday, the first home shuttler to title here since 2008. Ng Ka Long started on his dream run last year. He had to wait 12 months to bring some closure to that unfinished 2015 business. True, the 22-year-old Hong Kong shuttler did not have to face legends like Lee Chong Wei or Lin Dan in this year’s edition. In fact, he didn’t have to beat any seeded players but as he and many other players have proven this year, you don’t have to be seeded to be really tough to beat, or to win a Superseries title! All three games against India’s Sameer Verma were somewhat one-sided. It was the first time the two men had faced each other since their junior days, when Ng was still at least as focussed on his doubles game and Verma was already committed to singles. 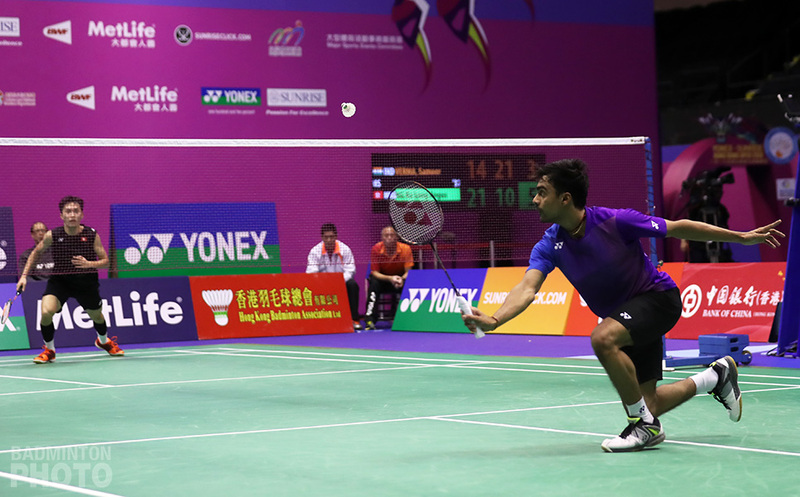 On the last point, Verma was fully committed to his last net push and Ng Ka Long was able to punch the shuttle over the Indian’s head to take the title. He dropped to his knees in celebration as the Hong Kong crowd erupted. 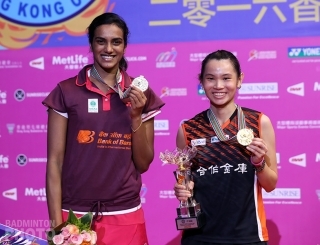 In the first match of the afternoon, Tai Tzu Ying stopped the two-week winning streak by Pusarla Venkata Sindhu (pictured) just short of a perfect ten. She beat the Olympic silver medallist from India in straight games to prevent her from taking a second straight Superseries title after her victory at the China Open last Sunday. Tai took back the title she won in 2014. 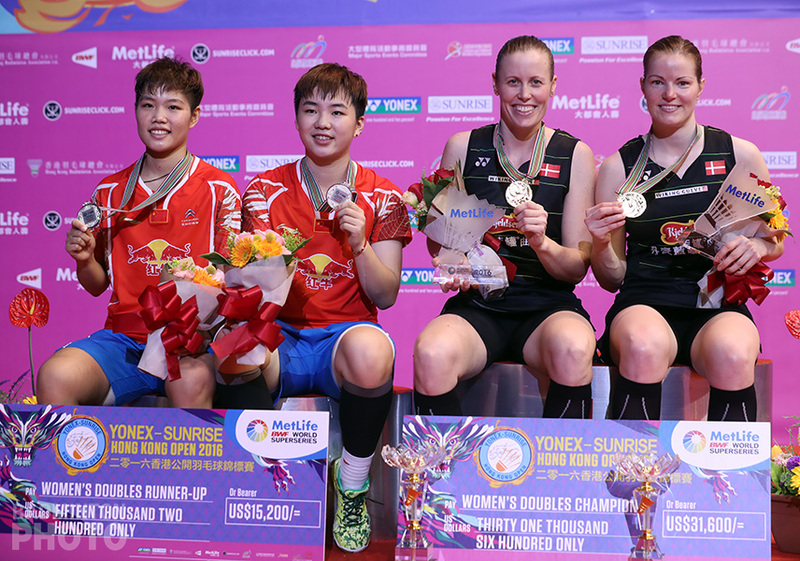 That year, she followed it up by winning the Superseries Finals and she is the Superseries leader this year. Sindhu will be among those attempting to deny her a repeat title in Dubai next month, as she booked her first appearance in the season-ender earlier this week. In the fourth match of the day, Kamilla Rytter Juhl and Christinna Pedersen made sure that China would go without a title for the second consecutive week. Their opponents Huang Dongping / Li Yinhui (pictured) were the only Chinese finalists in Hong Kong and the youngsters stayed close in the first game before the Danes dominated the second. The Danish pair thus exacted some payback for their loss last week at the hands of the young Chinese pair. Huang and Li are among the few who are slated to be in action as early as next week, at the Macau Open. P. V. Sindhu and both men’s singles finalists are also entered for Macau but whether the two Dubai-bound shuttlers have a last-minute change of plans remains to be seen. The regional destination of the mixed doubles title was known before the finals began on Sunday as it was an all-Indonesian affair. It was the Olympic gold medallists who beat the All England champions in two close games. Liliyana Natsir and Tontowi Ahmad (pictured bottom) thus became the only doubles pair to win Superseries titles in consecutive weeks in 2016. 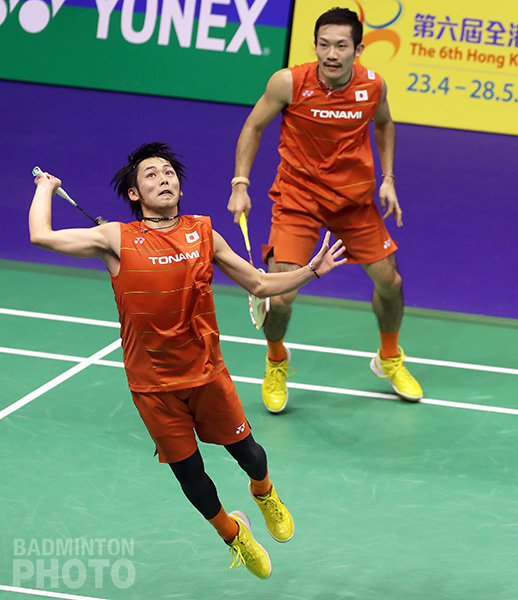 The Japanese world #1s won consecutive Superseries events in the spring but they were several weeks apart. Denmark was not allowed to take two titles in Hong Kong, however. In the last match of the day, Takeshi Kamura and Keigo Sonoda (pictured) became only the second men’s doubles pair from Japan to win a Superseries title. In the first game, the Japanese pair maintained a slight lead and kept their nerve when the Danes caught them at 19-all. In the second, things seemed to be going even more their way as they raced out to a 17-11 lead, only to be reeled in at 17, then again at 19. Once again, the energetic Japanese players managed to calm down and play two quality rallies to finish out the game, and the match. With the win, it meant that the titles went to representatives of five different nations, as had happened in the Superseries Premier events in both Malaysia and Indonesia before the Olympics. With Chinese Taipei, Indonesia, Hong Kong, Denmark, and Japan prevailing, this was the first time that China was not among that collection of five.